Luscious, mellow aromatic blue Cheese. Milk is bought from a local six-herd cooperative, which includes one herd of Ayrshires and the rest are Holstein-Friesians. Ayrshires are a traditional Scottish dairy breed and produce excellent milk for cheese making. More about Strathdon Blue Cheese ... A rich, creamy blue made with milk from the two remaining dairy herds in Caithness. Produced by Ruaraidh Stone, from Traditional Friesian and Ayrshire cows that can cope with the climate of the treeless country overlooking the Pentland Firth and Orkney. The milk from these cows is high in butter fat and protein and this combines to give the body and rich texture of Strathdon. Its creamy texture should come as no surprise since Ayrshires are renowned for their rich milk. The recipe is still in progress as Ruaraidh likes to experiment. He has changed rennet and ways of salting, to name but two things, and the cheese has developed over the couple of years in which we’ve sold it from a crumbly cheese to one that is rich, full and creamy. 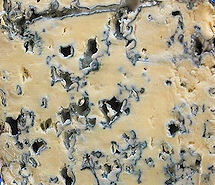 Strathdon Blue Cheese; a lovely creamy Blue!